Project scope: The mission for Caring Hearts and Hands of Hope Inc. is to touch and improve the lives of orphan children and children of widows and/or poverty stricken parents in Kenya who have no food or financial support for high school education and lack means for predictable livelihood. This site is dedicated to raising money to help orphans in Kenya to raise themselves out of poverty through education. 100% of all funds raised through donations to Caring Hearts and Hands of Hope goes directly to school tuition. 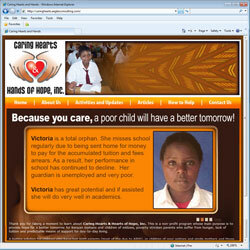 The site was produced and hosted at no charge as a gift to Dr. Vincent Kituku and the children and widows of Kenya. “ To attempt saying Thank You to you can not truly express my appreciation for your help with a website that is already getting productive hits (when someone reads what is on the website and acts). But that is the only phrase the English language has given me. So THANK YOU. After the site was working, I got a phone call from someone who had read each and every page and all the articles posted on our website. He was so impressed that he promised to sponsor eight orphan students (or children of widows or those from poverty stricken homes) in high school in Kenya each year. He mailed a $2,000 check the following day.